We’re all about Edo era sushi. For sushi purists, the Edo period (1603—1867) is the only era that matters. One of L.A.’s newest sushi restaurants pays tribute to that epoch: Q by Chef Hiroyuki Naruke opened to the public last Friday, November 15. Here, old school sushi is the rule, not the exception. The city of Tokyo was once known as Edo, which is where sushi as we know it today was born. 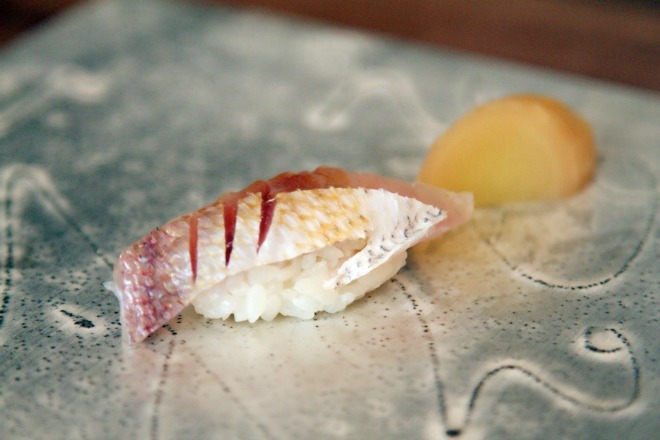 Nigiri, the hand-formed bundle that joins a thin swath of fish from Edo Bay with a small cluster of vinegar seasoned rice, was all the rage back in the day. It was fresh, fast, inexpensive, and delicious. No wonder it flourished. Itamae or chef Hiroyuki Naruke (known as Hiro) was just this year wooed from Tokyo by partners of the Los Angeles law firm Quinn, Emanuel, Urquhart & Sullivan to open an Edomae-inspired sushi concept. Here, sushi aficionados can revel in purely prepared sushi— a strict no pre-cut fish policy is followed. Exquisitely fresh seafood is gently embellished with minimal seasonings like soy sauce, yuzu, and, when suitable, real wasabi root freshly grated against shark fin. Nekaseru, or fermenting, a traditional technique that pre-dates Edo, is also practiced by chef Hiro at Q. Locally sourced seafood is emphasized here, marrying Old World techniques with New World ingredients. Uni, or sea urchin, sourced from San Diego and presented gunkan-style is a prime example of Hiro’s style. His preparation of the sea creature renders it creamy beyond reason; its oceanic flavors shine through without the slightest bitterness. Within the 20-course omakase experience you may get a taste of the unfortunately named idiot fish. This fish also goes by a (slightly) less demeaning and more descriptive moniker: shortspine thornyhead. Served as a nigiri, this idiot is surprisingly shrimp-like with firm, snappy flesh. A soft sweetness comes through despite its dimwitted nickname. Actual time travel may not yet be an option, but for an Old World sushi experience, look no further than downtown’s new Q by Chef Hiroyuki Naruke. Q, 521 W. 7th St., Downtown, 213-225-6285, QSushiLA.com.